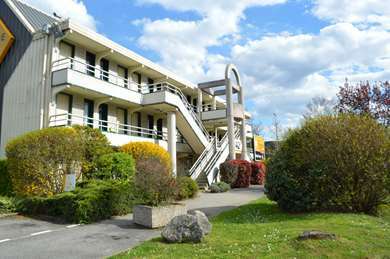 Hotel Kyriad Chambéry-Sud – La Ravoire is in ski country near your favorite resorts, with an ideal location near Chambéry. Our establishment welcomes you throughout the year near local hiking trails. 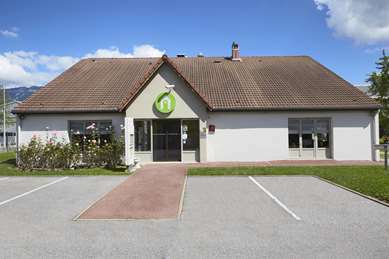 The hotel is just under 2 miles from Chambéry, and highway A43 (exit 18) and 6 miles from Chambéry-Savoie Airport. You can take advantage of a quiet setting without being too far from the most popular destinations. Whether you're here for a business trip or family vacation our hotel provides warm hospitality and the comfort of its 46 pleasant modern rooms. Our complementary services include free enclosed parking, free Wi-Fi, a magazine stand, crib and bottle warmer (upon request) and a lounge with a large screen TV. Our hotel has 46 modern rooms on two floors. You can choose: a double bed, separate single beds, etc. Family options and connecting rooms are also available. 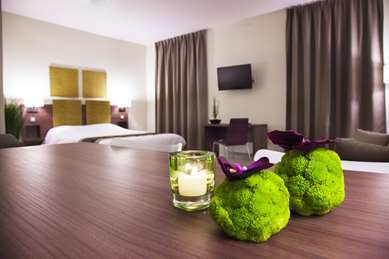 All our rooms feature and LCD TV, desk with phone, private bathroom with shower and hair dryer. A courtesy tray with electric kettle tea, coffee, water and cookies is offered. You also have free access to the hotel Wi-Fi. Two of our rooms at Hotel Kyriad Chambéry-Sud – La Ravoire are specially adapted for people with reduced mobility (please mention when making your reservation). Your quiet, secure, comfortable, entertaining and friendly Hotel Kyriad Chambéry-La Ravoire provides you with all the services you need for your comfort and convenience. My wife and I have just returned from a holiday in the beautiful Rhône-Alpes region of France with our small French bulldog, where we stayed for 9 nights at the Kyriad Chambery La Ravoire. We had a smallish but adequate double room with en-suite bathroom (housing an excellent shower rather than a bath), a wall-mounted flat-screen TV (which we hardly used, preferring to access the internet via the free WiFi through our laptop and tablet), a table and one chair, increased to two chairs at our request! There were basic coffee-/tea-making facilities too. The view of the surrounding mountains from our window was breathtaking! We enjoyed the in-house buffet-style breakfast, offering a range of hot and cold items, on 6 mornings at 9 euros per person and free for our dog . This was most convenient since, if you don't have a car or use a taxi, you need to hop on a bus to get to central Chambery, a 15-minute journey. The staff were friendly, helpful, and had a working knowledge of English. By the way, the Buffalo Grill restaurant next door was open every day from around noon to around 11 pm, an excellent choice for meals when not in central Chambery and also welcoming our pet! Very friendly and welcoming hoteliers, used as stop over from England to Italy. Very comfy bed, spectacular view of mountains from room. Adjacent to Buffalo Grill, near to supermarket, secured car park, however room a little tatty, could do with a bit of maintenance. We thank you for your message. We are very happy to read that you made a good stop in our hotel. We do our best everyday to make our customers satisfied ! An easy to find hotel with good safe parking secured at night. The hotel has a Buffalo grill within 50m, so dining is easy. Breakfast in the morning is adequate with a good variety. In fairness we only booked this hotel because there was no space in our first choice Chambrery stop over. Hotel reception were lovely and helpful and the room was clean and perfectly adequate for our needs. Minor quibble was that the sink plug was missing but remedied by improvised use of base of toothpaste tube. We popped to the Buffalo Grill (100m walk) for burgers & ribs. Hotel is a good stop-over. Not going to tell you our first choice as we will never get a room! We thank you for taking time to write this opinion. We are pleased to read that everything was OK for your stay in our hotel. Each day, we make our best so that our customers live the best possible stay ! We stopped here en-route to further south in Spain. A good place for a one or two night stop I'd say. Its close to the highway, the main town of Chambery is close by but we did not have the chance to explore it. There are a couple of buses that go in to the town. Hotel is a nice, clean, basic place. Good breakfast with plenty of the usual fare to choose from, very helpful receptionist / manager. Speaks English and French. Views from the hotel of the Massif are spectacular. Its just off the main road, next to a hideous looking Buffalo Grill ... if you like that kind of thing! But we found one of the restaurants nearby recommended by the manager called the Pataterie. Very good value. Close walk of 5 minutes. Rooms are basic but comfortable. Bathroom was a tight squeeze! TV, wi-fi, tea-kettle. Most of what you need for a night or two. And I guess useful for exploring the region where you are likely to be out for the day. We are pleased to see that you enjoyed you stay in our hotel ! You're right, we live in a very very nice area ! Thank you very much for your compliments. We hope we'll welcome you soon !